Hey guys! Long time lurker but not the most active user. But, now I decided to do something I've thought of for a long time. Have a dev log here. Love the community here so why not? The Tavern is a (fairly)simple management game with a lot of charm. Player takes control as a tavern keeper. Your role is to supply the customers with their quirky drinks and keep them from killing each other. Just like any normal bar, pub or restaurant would do right? Your customers comes in different shaped and forms. You got the brawly Barbarians, Dwarves, Wizards and so on. When gold starts to come in, you can expand your cozy little place. The game takes inspiration from Dungeon Keeper, Sim City and to some weird degree, the old Sierra games like Space Quests. We're a small team that met during our game development education lead by Sjoerd "Hourences" De Jong among others. He also helps with advises during this. We have a company called Lost Anchor Games. We've worked on several projects together and all of us work, or are working closely to a several AAA companies. Choose between three tavern owners to play as (Experienced chef, pirate captain, cunning witch)(these will have names further on). These have individual passive and active abilities. Grow your tavern; Upgrade interior, update your menu, buy rooms with special abilities to enhance your staff and tavern. Hire staff to serve your customers (Servers, Bouncers, Grave Keeper). Expand the graveyard to grow your tavern’s popularity. 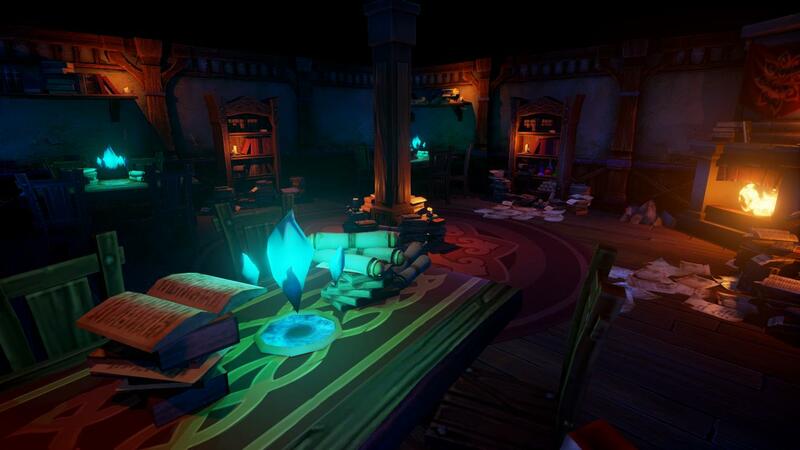 Explore your tavern creation in first person mode(VR is very much considered). Take care of your different customers to unlock special songs and tales. Discover rich mythology through your customers’ background stories. Unlock mysteries by paying attention to what's being whispered in the darkest corners of the Tavern, e.g who was the real killer of the King's son? Random events keep you on your management toes; From withstanding attacks from goblins to surviving a visit from the tax collector! I'll start by posting our latest update. This is a screenshot from our dwarf room. All customer types have their own rooms that you need to build to attract them and for them to have a place to sit. We're still working on getting the final lighting in this but it's on its way. Regarding the gameplay itself, it almost makes me think of a "subgame" or "minigame" in what would be an otherwise "normal" RPG like Skyrim or The Witcher. Very interesting, and I'll be keeping my eye on this one for sure! Edit: I forgot to say: Your website isn't working D:. I'm not sure if it's not finished or something, but all there is is a logo. Might be intentional? I'm not sure. Either way, I'd love to learn more about you and your team! It sounds really good! What scale is the tavern going to be? 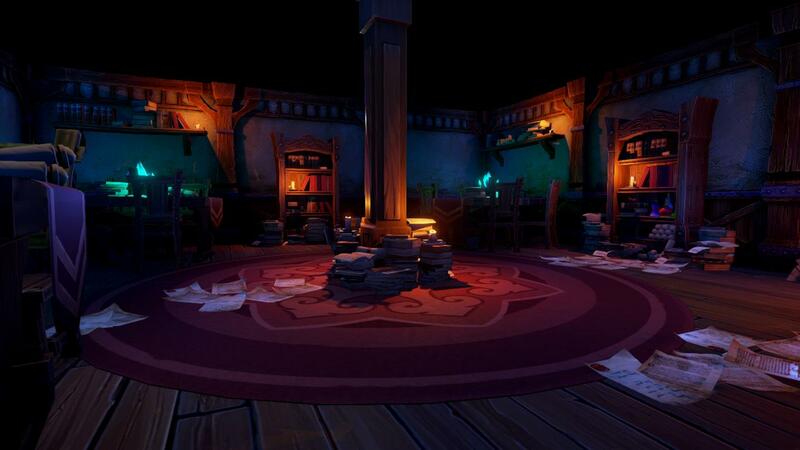 Having this room filled with dozens of characters would be amazing. Really interested in seeing what the gameplay is like. I am curious, will this game be in first-person or Dungeon Keeper-overhead? Or other? That's the idea! A tavern is always such a central piece in any RPG and I figured so much stuff must go on there. And I've always had this romantic idea of a tavern since I was a kid and played Dungeons and Dragons. Hey that sounds great! Music plays a huuuge part in this game. The idea is that rooms can become "On fire! ", similar to Overwatch's. That happens when a room is 100% filled with customers, then that specific room sings their own song. Dwarves have their song, elves their own and so on. This also boosts gold income and more. This music can only be heard in first person mode, when you take control of your tavern keeper. So you can walk around and listen too all these specific and encouraging songs. I've had a lot of interest from various musicians but this is something I will take up later on. I'm keeping your post. Or mail me if you have ideas how you can add to this: [email protected]. Right now we don't have a limit on how big each floor is gonna be. But I'm imagining each floor will have about 10-15 rooms before you need to build another floor and continue building on that. This will purely be a design decision since it's quite optimized already so performance isn't really an issue at this point. It's quite amazing seeing a lot of various types of customers walking around in all rooms. 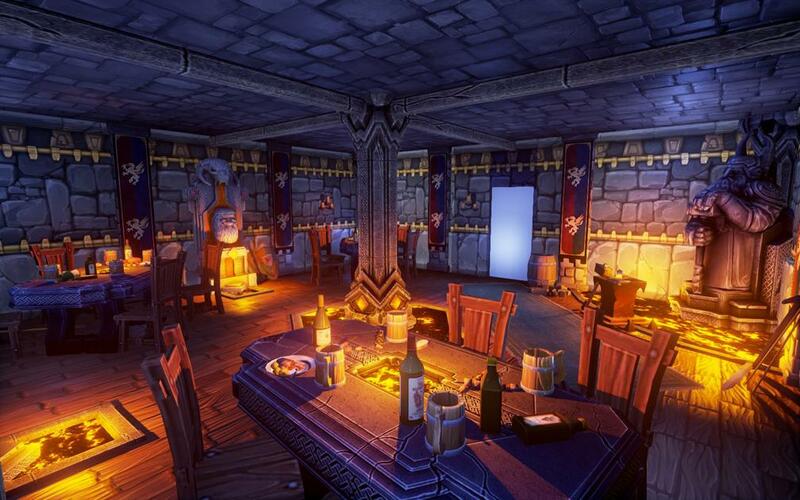 That's the ambience I'm striving for, a busy tavern. Both! 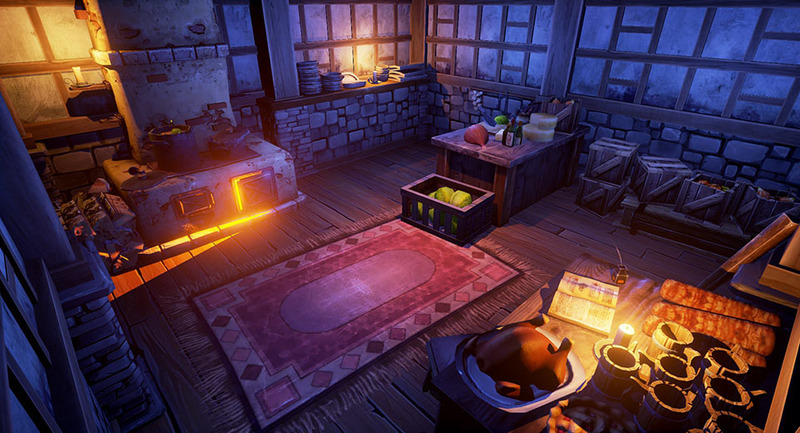 Main gameplay takes place in a Dungeon Keeper like mode, top down. But you can also enter your tavern keeper and run around in first person mode. This also has gameplay elements that's exclusive to first person mode. We're also discussing VR possibilities for not only the first person mode, but a board game like feeling when using it in top down mode. But this is not for the first release of course but later on. Wednesday is small #screenshotsaturday right? Anyway, here's a peak in the wizard room. Currently in the process of replacing the prototype room in the actual gameplay. Is your biggest dream to work as an underpayed cook in a kitchen where people might fight over a simple and trivial things as who killed the troll's mother and hang her head on the wall in the barbarians' room, or an elf who secretly poisoned a wizard's drink but the wizard already knew about this and had planned his retaliation months ahead so now that elf's corpse rest in the cemetery nearby? Or maybe you just like the smell of dried wineberries boiling together with roots of a cursed tree when you're trying to come up with some new mixtures for drinks? Then apply for our available position as a cook, in The Tavern! Kitchen and main area has been redesigned. A better flow for all customers and staff to walk through and everything feels more logical right now. Holiday season steals dev time of course but there's always time to do some stuff. Can't wait to show some actual gameplay soon! I'm really liking the atmosphere of this game, and it's right up my alley. I'm curious though, is this going to have a diner dash feel to it? Do customers get impatient and leave if you don't serve them quick enough? Looking forward to seeing gameplay! I haven't played Diner Dash, just watched a gameplay trailer now that you mentioned it, but yeah. I think Diner Dash has more tap and reaction mechanics, but The Tavern has more of a management gameplay style. You buy stuff, things happen sorta. Customers leave if you don't have drinks for them, or if all their gold has run out. As long as your popularity is at a certain level, more customers will always enter the tavern so you don't have to worry about customers leave when their gold is out. They usually end up in fist fights though and that leaves their bodies elsewhere. There's a few more "mood and event" variables that plays in than just this but that's the base of it. Third tavern keeper is taking place... Missing her hair and other details though but it's on the way. 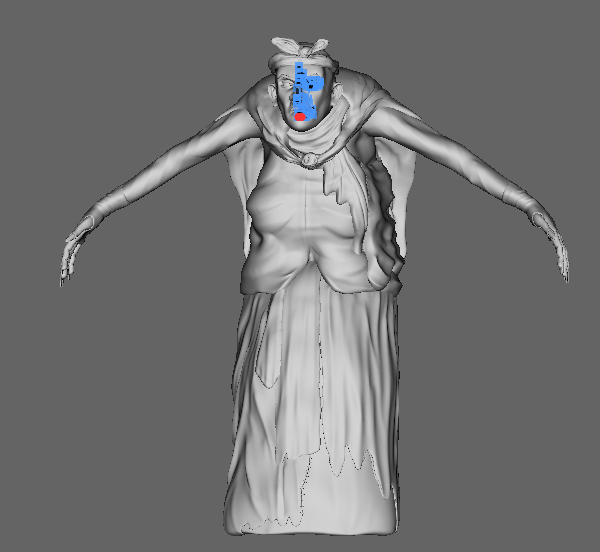 This is an old lady, might have given up on her poor conditions living in a swamp, tired of mixing the same useless remedies for towners seeking her aid, and now settling for her own tavern in the middle of the city. Will this be your option when you choose who shall represent you when you build your tavern? Oh boy! She looks like she'd be a witch/mage of sorts. Hopefully she's a NICE caretaker! YEah, the idea is that she's an retired witch starting up her own tavern now, tired of living in the swamp. She's one of a few others that you get to choose from. I'll be posting a screenshot of another soon. Ok that's cool, I may be able to come up with something that fits. Out of interest what are you plans in terms of what platform will the game be on (PC, Online etc.) and will it be free to play or sold? PC, single player and a payed product. Ok then. I sent an email, in case you wanted to discuss the music further.